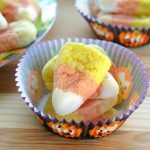 You’ll enjoy these Easy Vegan Candy Corn Sugar Cookies even if you aren’t in the “I Love Candy Corn” camp. If you do, I have some good news. Not only is Halloween just around the corner, but October 30th is National Candy Corn Day. Whether you loooove or hate this Halloween staple which can incite very strong reactions, you’ll enjoy these tiny cookies. Aren’t they cute? This recipe can be made with egg. But, we used an egg-replacer. In fact, almost all of our cookie recipes are vegan. If you are avoiding egg and dairy, we’ve got you covered for Halloween. 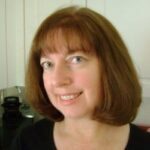 Add Harry Potter Golden Snitch Truffles and Easy Almond Butter Fudge decorated with Halloween sprinkles to the menu! The instructions to make the dough are in the recipe directions below. It’s a standard sugar cookie recipe so feel free to use your own and use this technique to color and shape the cookies. 1. Once the dough is prepared, divide it into 3 equal sections. 2. Tint one section of dough yellow by making a well in the dough and placing one or two droplets of yellow food coloring in the middle. Knead the dough until the coloring is uniform throughout. 3. Tint the second section orange by making a well in the dough and placing one droplet of yellow food coloring and one droplet of red food coloring in the middle. Knead the dough until the coloring is fully distributed. Note: One section will not be colored at all. Remember to start with just one or two droplets and then mix. You can always add more if you need to. 4. Spray a 9 x 5 loaf pan with cooking spray. Layer the dough in the pan as follows: plain, orange and then yellow, pressing each layer down before adding the next. Cover with plastic wrap and chill in the refrigerator for 2 hours. 5. Once chilled, turn the dough out onto a work surface and slice into 3/8 inch slices. 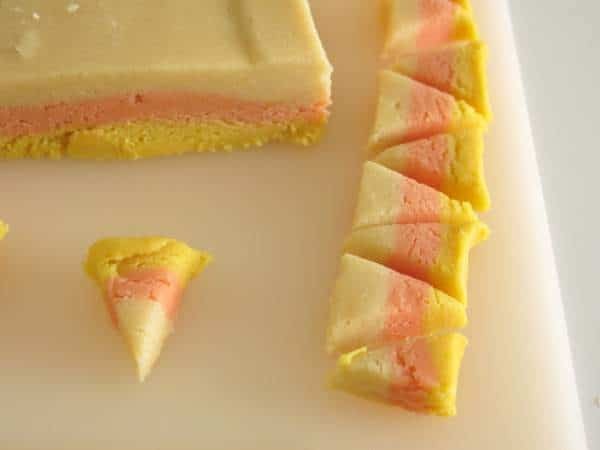 Lay each slice on its side and cut it into candy corn shaped triangles. 6. Bake at 350 degree F on a parchment-lined baking sheet for 7-9 minutes. Remove from oven before the cookie is brown or crisp. It will continue to firm up after you take it out of the oven. Allow the cookies to cool for a minute or two on the baking sheet and then remove them to a wire rack to cool completely. 7. To frost the tips, mix together 1/3 cup confectioners’ sugar and 1 teaspoon water. Add more sugar or drops of water to achieve a thick consistency. Dip the tips into the glaze, scraping excess icing off the bottom, and then return the cookies to the wire rack or wax paper while the glaze sets. 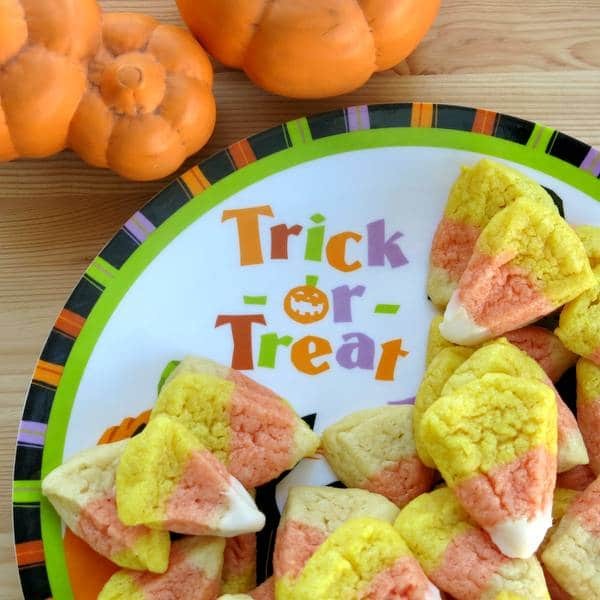 It’s hard to resist candy corn, including the sugar cookie variety, this time of year! 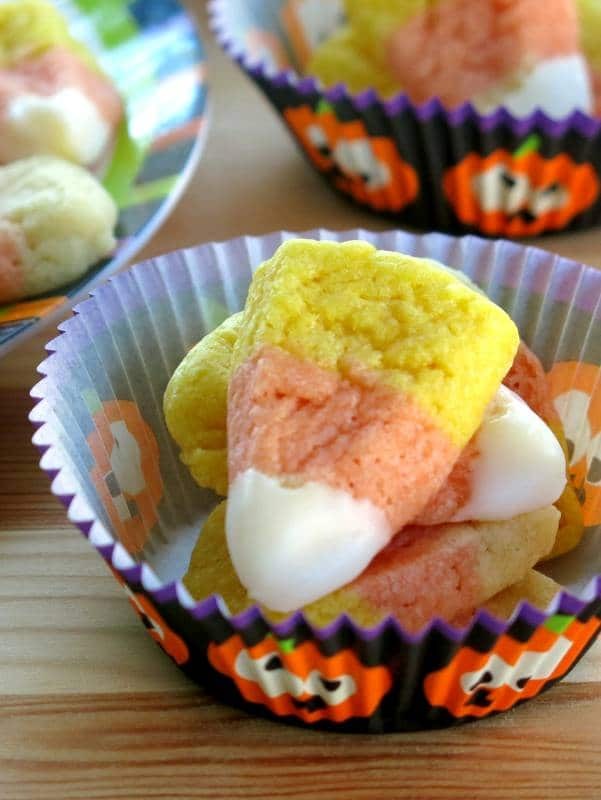 These candy corn sugar cookies with frosted tips are as cute and addictive as the real thing. A fun treat for your Halloween party. Cream butter and sugar together with an electric mixer for about 5 minutes until light and fluffy. Prepare egg replacer in a separate bowl. Add egg replacer and vanilla to creamed butter mixture and stir to combine. Add flour and salt to butter mixture and stir to combine. Make a well in one section and add one to two drops of yellow food coloring. Knead dough until coloring is evenly distributed. Set aside. Make a well in the second section of dough and add a drop of yellow food coloring and a drop of red food coloring. Knead dough until coloring is evenly distributed. Set aside. Note that the third section is not colored with food coloring. Spray a 9 x 5 inch bread loaf pan with cooking spray. 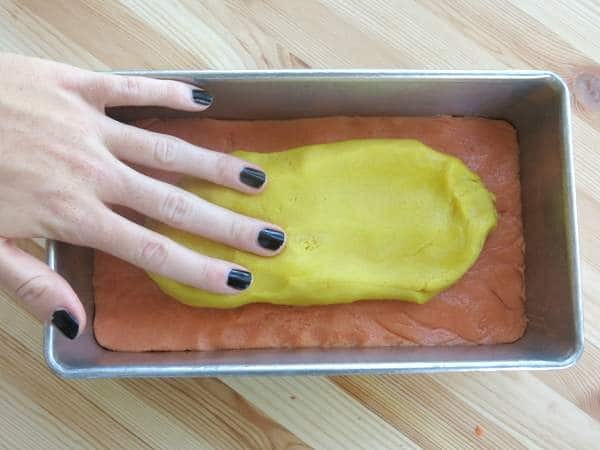 Press dough into the loaf pan in layers in the following order: plain, orange, yellow. Cover and chill for 2 hours in the refrigerator. Turn dough out onto a work surface. Bake cookies on a parchment-lined baking sheet for 7-9 minutes. Note that the cookies will continue to set after they are removed from the oven and should not be brown when you take them out. To make frosting, combine confectioners' sugar with 1 teaspoon of water. If necessary, add small amounts of water or confectioners' sugar until the mixture is a thick glaze. Dip tips of cookies in the glaze, scraping excess off of the bottom of the cookie. This recipe originally appeared in Coastal Living. We made it vegan. We also dipped the tips of the candy corn sugar cookies in some icing…we just couldn’t resist! Enjoy your Halloween and these candy corn sugar cookies!